A six part documentary done by the UMWA in the 1970s talking about Blair Mountain. Audio is one of the best resources a historian or reenactor can use to get some insight into the minds of the people involved with episodes in the past. The following audio files come from Mary Fufford’s interviews with miners that fought at Blair Mountain. Joe Aliff talks about the events that happened at Blair Mountain. Dewey Gunnoe talks about coal company violence against union organizers in the 1920s. Be sure to check out Raymond Crooke’s collection of mining songs that date from before and after the events at Blair Mountain. Many of these may have been sung on the march towards Blair Mountain. While the Ludlow Massacre in Colorado was almost ten years before Blair Mountain, the miners were fighting for the same right to organize a union in the coal mines.The Ludlow Massacre resulted in the violent deaths of 19 people during an attack by the Colorado National Guard on a tent colony of 1,200 striking coal miners and their families at Ludlow, Colorado on April 20, 1914. The deaths occurred after a day-long fight between strikers and the Guard. Two women and eleven children were asphyxiated and burned to death. Three union leaders and two strikers were killed by gunfire, along with one child, one passer-by, and one National Guardsman. In response, the miners armed themselves and attacked dozens of mines, destroying property and engaging in several skirmishes with the Colorado National Guard. In response to the Ludlow massacre, the leaders of organized labor in Colorado issued a call to arms, urging union members to acquire “all the arms and ammunition legally available,” and a large-scale guerrilla war ensued, lasting ten days. 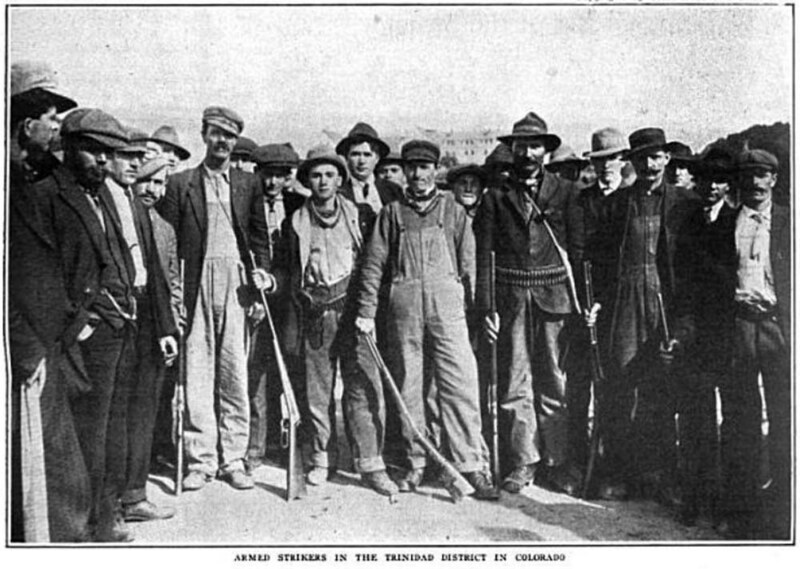 In Trinidad, Colorado, UMWA officials openly distributed arms and ammunition to strikers at union headquarters. 700 to 1,000 strikers “attacked mine after mine, driving off or killing the guards and setting fire to the buildings.” At least fifty people, including those at Ludlow, were killed in ten days of fighting against mine guards and hundreds of militia reinforcements rushed back into the strike zone. The fighting ended only when US President Woodrow Wilson sent in Federal troops.The troops, who reported directly to Washington, DC, disarmed both sides, displacing and often arresting the militia in the process. This conflict, called the Colorado Coalfield War, was the most violent labor conflict in US history; the reported death toll ranged from 69-199.